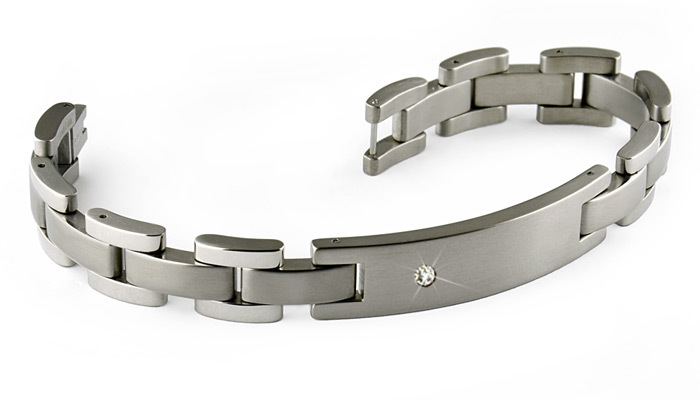 Our titanium bracelets are made from only the best quality solid Titanium. Titanium bracelet is a great option for anyone who leads an active lifestyle or just wants the kind of quality that will last a lifetime. Titanium is famously durable, being highly resistant to bending and breaking. Although it is quite sturdy, it is also surprisingly lightweight. The unique durability and beauty aren't the only benefits of buying titanium bracelets. There are also a variety of styles to choose from, with differing link sizes and shapes. All bracelets come with personalization options, links can be removed for a longer or shorter length and fold-over clasps (also in titanium) are featured on bracelets to make them easily removable. With the solid construction, customization options and timeless beauty of titanium bracelets, you are purchasing a treasured keepsake that will remain stunning for years to come. Many bracelets are now on sale for up to 70% off, so it is a great time to buy birthday presents and anniversary gifts for the bracelet aficionados in your life. The quality of the titanium bracelet I received is top notch: flawless finish, links fit smoothly and uniformly. 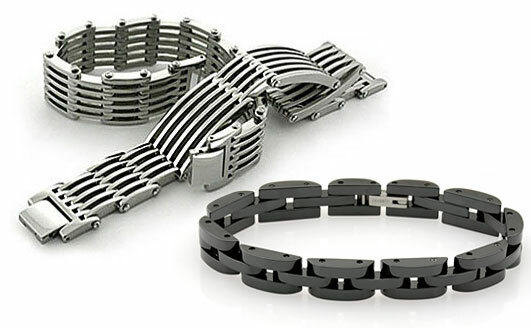 The links were solid machined titanium and heavy while at the same time feeling light - hard to explain, titanium is a light metal so the bracelet is comfortable to wear but it also feels "heavy" or substantial without weighing down my arm. Excellent product! Well you did it again. First a beautiful promise ring, then a great wedding set, and now 2 great looking titanium bracelets. And they all look great together. The service was the greatest and I would highly recommend this company for the quality of their products and their service. Can't say enough good about them. My wife purchased titanium bracelet for my birthday. It is perfect for everyday wear & looks great. I am in the process of ordering a new wedding band. Customer service is quick, easy & very courteous. Thanks for making a great product! We now have two titanium bracelets from Avant-Garde. I loved my Bracelet so much, I just bought one for my new wife. She was also very impressed with the workmanship and style of the bracelets. Thanks for making such a stylish and affordable piece of jewelry. More customer reviews can be found on our Testimonials page.